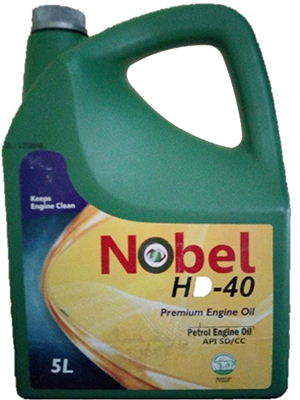 Nobel SAE 40 is a high performance monograde engine oil primarily intended for use in gasoline automotive engines of passenger cars, commercial vehicles and farm equipment. Nobel SAE 40 is a blend of highly refined mineral oils with high performance additives. They are blended to meet API service classification SD/CC requirements. Nobel SAE 40 are engineered to resist thermal breakdown, so you can drive confidently in warmer temperatures. They are formulated to protect your engine and provide maximum performance for passenger cars and light trucks and performs at its best in temperatures above 60 degrees Fahrenheit.